Pascal, a Frenchman living in Russia, has been studying Russian at CREF for the past two years. He was kind enough to talk to us about his impressions regarding the Russian language, Russia and CREF. Cref: Hello, Pascal! So tell us, what brought you to Moscow? Pascal: Hello! Well, I met my Russian girlfriend in France. When I retired shortly thereafter, I decided to join her here in Moscow, where she currently works. Cref: Were you already familiar with Russia? Pascal: Not at all! Well, apart from what I had seen in the media! I had never been to Russia and I did not speak any Russian. Cref: So you decided to learn Russian once you were here? Pascal: Yes, that is right. Initially, I signed up for six-week intensive courses at Moscow State University, but they were not easy to follow because the instructor would explain everything in English and I my English is not very good. Fortunately, some French-speaking students helped me with the coursework. Then, I discovered CREF, which offers customized individual lessons and visa assistance. I felt that was a more convenient way for me to start life anew here. Cref: Did you find Russian difficult at first? Pascal: Not really, but then again I love Russian, its intonation, vocabulary, the way it’s written, even if the declensions might be a little complicated. What I like is that I can now understand Russians when they speak, and they can understand me when I speak. Cref: Do you have any advice for those who are learning or would like to learn Russian? Pascal: You cannot pick it up, as you would English. In France, English is everywhere, while Russian is almost non-existent. Everything is new and you have to start from scratch. Of course, you should never give up, even if you feel you are too old to be learning a new language. I would also recommend not rushing through it. Take time to absorb the fundamentals before moving forward. 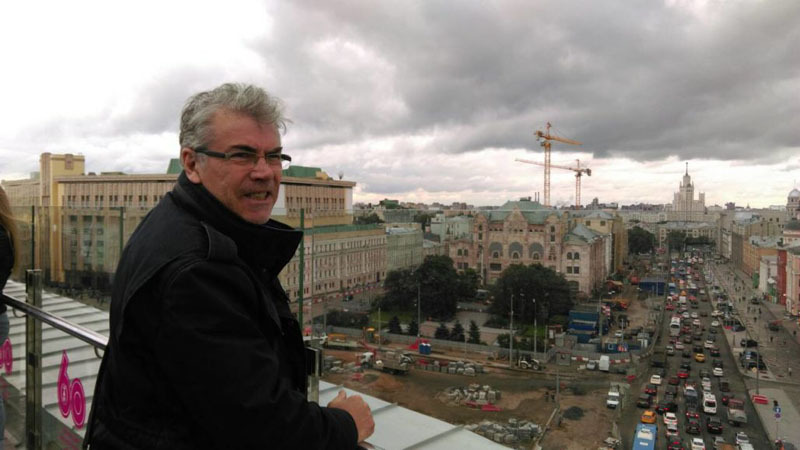 Cref: What do you think about Moscow? Pascal: I learned that life here is not what I expected it to be. I mean that in a positive sense, because, coming from France, one would hear rather negative things. There is plenty of space, many things to see, lots of activities and entertainment venues. Even if there is a certain level of individualism, the collective impulses here are very alluring. One does not feel suffocated like in Paris, and I like that. Cref: What are some of your favorite places in Moscow? Pascal: VDNK Park. There are many things to do there both in the summer and in the winter. There is an aquarium, for example, as well as several interesting museums like the one for the sculptor Tsereteli or for the army. Zariadie Park, which opened recently, provides views of the churches from Varvarka Street. If you are not averse to spending a bit of money, you could try the 72nd Floor restaurant in Moscow City. Cref: Do you like any food in particular? Pascal: I like to cook meat or fish and then add cheese or mayonnaise on top. I also like borsch (cabbage and beet soup). Cref: What is your favorite Russian word? Pascal: Любовь (Liubov) – “love”, of course! Cref: What are three things you like, and three things you would like to see improved, about your lessons at CREF? Pascal: I really like how friendly the atmosphere is, how flexible the schedule can be, as well as the highly competent teaching staff. It is also quite convenient that everyone speaks French, since this helps me avoid misunderstandings. In terms of improvements? Frankly, I cannot think of anything. We would like to thank Pascal for sharing his impressions and his appreciation of our work! We wish him continued progress with his Russian studies and hope he continues to enjoy his new life in Moscow!